The Legacy Series represents 50 years of design, innovation and industry experience at Gallien-Krueger. Bob Gallien remains at the helm of the company, still working in the lab daily, as he did in the beginning, to create the best sounding, most versatile, and reliable professional bass gear available. Because the Legacy Series shares the same designer as the 800RB, it shares the same DNA and the same level of innovation, with a more evolved feature set and construction concept. The introduction of the 800RB, in 1980, cemented Gallien-Krueger as a leader in solid-state bass amplification, with its signature growl, clarity, power and features that were ahead of its time. The Legacy Series of heads captures that same aesthetic while adding something all its own. From clean, clear, biting tones, to saturated overdrive, the Legacy series has it all. Coming in 500, 800 and 1,200W Class D models, the Legacy heads are ready for the biggest stages, the smallest living rooms, and everything in between. To improve performance and reliability, the Legacy Series uses a unique interconnection system that eliminates problems that can develop over time from constant vibration and temperature extremes that gear is subjected to with heavy use. Using circuit boards with gold-plated connectors, rather than cables with standard tin connectors, this type of construction delivers a more pure, reliable sound. 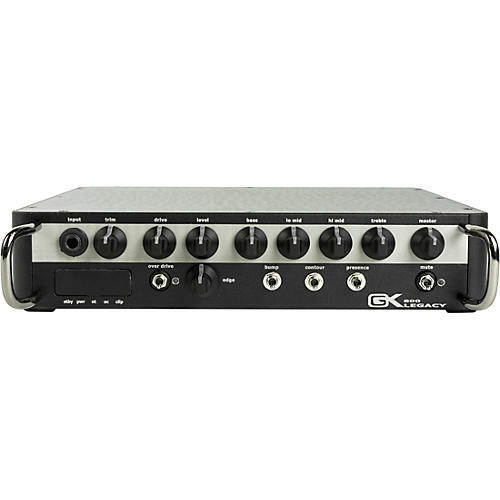 Features include GK's classic 4-band EQ, overdrive complete with tone shaping, additional voicing filters such as "Bump," "Contour" and "Presence", balanced DI with pre- and post-EQ, an effects loop, aux. and headphone connections, and Load capacity selection, to deliver optimum power into 2-, 2.7-, 4- and 8-ohm cabinet configurations. 2 years on electronics and 1 year on speakers.